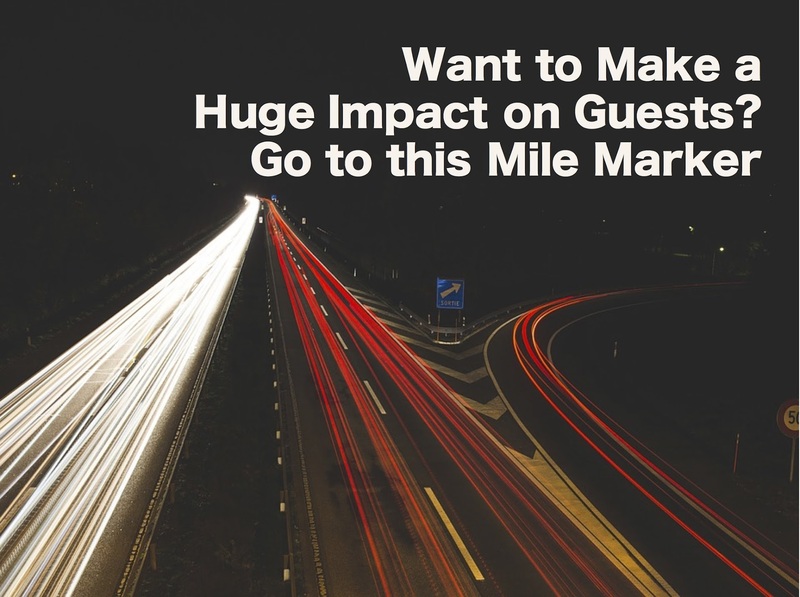 Do you want to make a huge impact on guests? Have them telling their friends, family and co-workers how much they enjoyed attending your church? Exceed their expectations and make such an impression that they are guaranteed to return? If your answer is "yes," then you must be ready to go past the first mile and journey to the 2nd mile marker. The kind of impact that can alter the course of a family's life happens at the second mile marker. The Disney company has lots of families that are raving fans. Fans that return time and time again. Families who have been fans for generations. And the impact that has made them such big fans has not just come from the rides, shows, food, parades or fireworks. It has come from the company empowering their team members to go the second mile in guest services. Here's an example. Recently, the Ramsaran family took their yearly spring break trip to Disney World. The mom, Kelly, had let her young son, Wes, pick out a special toy on the trip. Wes picked out a Slinky dog toy. He was so excited to have the new toy. On the way home, they realized Slinky was missing. They had left accidentally left him on a bench in one of the stores. After chatting with a Disney employee on the phone for over 30 minutes, they weren't sure if Wes would ever see his Slinky toy again. Later, after arriving home, Kelly received a phone call back from a cast member at the store. They had found Slinky! They told Kelly not to worry about the shipping for the toy and that it would arrive at their home in about 10 days. You're probably thinking, "That's awesome - they went the second mile for that family." When Slinky arrived at the family's home, he wasn't alone. Along with the Slinky dog toy was also a Woody doll, a bucket of toy soldiers, a specially addressed letter and a ton of photos showing Wes the adventure Slinky had been on before coming home to him. The photos showed Slinky at Disney World playing video games, shopping for candy and a host of other things, as if the actual toys from Toy Story were on an adventure in the park. Do you think the Ramsaran family will be back at Disney World? Do you think they will spread the word about how the company went the second mile for them? Do you think they will continue to be raving fans? Of course, they will. The second mile is what sets an organization apart from the rest. In this case, the average organization would have placed Slinky in a "lost and found" and told the family they could come back and get him on their next visit. Or they might have offered to mail it...if the family was willing to pay the shipping. But Disney is not an "average" organization when it comes to guest services and maybe that's the reason they're the number one vacation destination in the world for families. Here's the good news. There's not a lot of competition at the second mile marker. It's so rare, that when families encounter it, they are impacted in a huge way. One thing to remember. Most often, the opportunity to go the second mile will come from what seems to be an inconvenience. It wasn't convenient for the Disney employees to spend time taking pictures with the Slinky toy. It wasn't convenient to gather extra toys to put in the box. And it wasn't convenient for them to spend the energy and resources needed to mail the package to the family. But the inconvenience of going above and beyond is what opens the door for you to make a huge impact. What if you and your guest services' teams started seeing inconveniences not as an inconvenience, but as an opportunity? What if you saw the second mile not as a burden, but as a chance to bless a family? If you're really serious about making a huge impact on families, then here's what I would encourage you to do. Sit down with your team and make a list of ways you can go to the second mile marker. Especially focus on how you can turn the "inconvenient" times into second mile opportunities. When a parent calls about a coat their child left at church on Sunday that is needed for school - how can we go to the second mile marker? When a child loses their Bible and it is nowhere to be found - how can we go to the second mile maker? When a parent shows up without their check-out name tag - how can we go to the second mile marker while keeping our safety and security process in place? When a child has an accident at church and messes up his or her clothes - how can we go to the second mile marker? When a family misses church due to illness - how can we go to the second mile marker? When a child is in the hospital - how can we go to the second mile marker? When a single mom loses her car keys at church - how can we go the second mile marker? When a new family walks in the doors in the middle of a service - how can we go to the second mile marker? The first mile is easy. The second mile takes a lot of effort. But it's where you'll see huge impact happen. Come on! Let's head to the second mile marker! Your turn. The floor is yours. How does your team go to the second mile marker? What are some ideas and insight you have for going the second mile to impact families? Share your thoughts with everyone in the comment section below. p.s. You can get more great ideas from Disney for your guest service's ministry in the best-selling book "If Disney Ran Your Children's Ministry." Get it now at this link.